The Reivo "Super" band is the extra-long and versatile elasticated band for group games, ball games and swimming. A versatile product made in Germany! The Reivo "Super" band is versatile and can be used in over 180 different ways. With just one band, you can develop strength, speed and endurance as well as have a "net" for ball games. High-quality workmanship and with no metal or hard plastic parts, this elasticated band allows children and teens to have worry-free training. Can also be used to cover large areas in halls. The practical quick-release fasteners at both ends allows more Reivo bands to be attached. The Reivo "Super" band offers a great variety of uses. Schools like to use the band as a badminton or volleyball "net". The courts can quickly be prepared as many children can play on only one "net". The Reivo "Super" band is also great to mark or cordon off areas or to tow people when running, hiking, swimming or cross-country skiing. 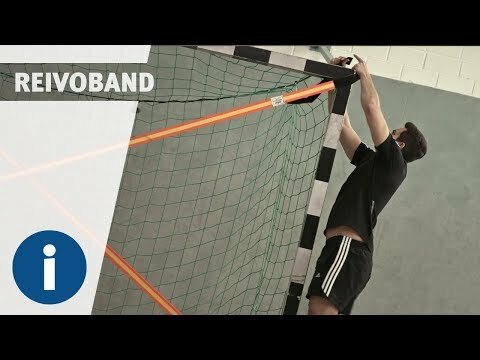 Playing and training safely – with the Reivo "Super" band from Sport-Thieme. 2. Stretches by up to 100%! 3. The "Hook-and-Loop system" at each end is extremely secure! 5. Very safe! The band has no metal or hard plastic parts! 8. Weatherproof, washable and non-fade! games, also for use in water! Removes the fear factor when learning and practising swimming, gymnastics, skiing and athletics etc.